Marriage. Marriage is what brings us together here today... to be, perhaps, possessed by an angry spirit. Piotr (Itay Tiran) isn't living in Poland. But when he and Polish beauty Zaneta (Agnieszka Zulewska) meet and fall in love, they decide to get married and move back to Poland, to fix up an old house Zaneta will inherit and return it to its former glory. There, Piotr meets Zaneta's father and mother - "Why couldn't you have married a nice local boy?" - and works to endear himself to the locals. He promises to help rebuild a nearby bridge destroyed by the Germans in World War II, and he throws himself into fixing up the old house and the traditional Polish wedding. But while he's doing some work around the house, a tree gets uprooted, revealing a long-buried skeleton. And that's when things start to go wrong for Piotr and his bride -- but never quite in the ways you expect. Because the heart of Demon is only half a horror film; the other half is that of dark comedy about the perils of trying to forget the past. Almost the entire film takes place during a wedding and the reception that follows. 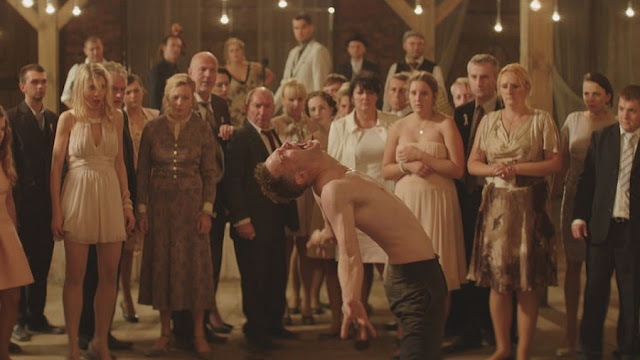 As Piotr's condition deteriorates rapidly and supernatural goings-on begin to encroach upon the evening, the increasingly drunk partygoers, particularly in Zaneta's family, try to pretend like nothing is going wrong. The sight of Zaneta's family trying to balance Piotr's possession with looking good in front of all the guests they invited was never not funny, and the willingness of the increasingly hammered guests to go along with some pretty weird stuff made the humans seem more odd and inhuman, at times, than the spirit that invades their party. Itay Tiran, a veteran stage actor, give the performance of a lifetime as Piotr as he fights off - and eventually succumbs to - his possession. We've all seen a hundred different actors possessed by a hundred different demons on screen, but Tiran's performance is so brutally physical that it's impossible to ignore. Particularly delightful is the decision to have him drinking heavily throughout much of the early film, confusing the symptoms we'd normally expect. Is he drunk, or possessed? Is he epileptic, or is he the victim of a haunting? Wrona makes sure the answer is never all of one or all of the other, which has a wonderfully disorienting effect for jaded longterm horror fans. Agnieszka Zulewska is similarly excellent, though she has, unfortunately, less to work with. For much of the film, Piotr tries to downplay how ill he is feeling and how weird things are getting, worried about ruining his new bride's day, but as things become clear, Zulewska gets to play both the tormented bride and the resolved wife, and she manages to make a potentially thin character resonate powerfully. Her whole family is well-cast, but it is Zulewska who is the clear stand-out to me. I'll often see a horror movie with a brilliant premise that gets so wrapped up in providing the expected genre thrills that it lets its own greatest ideas go to waste. Demon is not that movie. Demon took its brilliant premise and built on its in unexpected but undeniably entertaining way. Part of the power of great genre entertainment is the way it can explore complex thematic ideas through audience-friendly metaphors that ditch some of the heavy baggage in favor of fleet, effective storytelling. Demon is phenomenal in that regard. Because, sure, there's a reading of the film that makes it an inverse to the excellent 2014 horror film Honeymoon, about how little you know about the person you are marrying. But that's not the core of what Demon is about. Instead, Demon's fears lean more towards a different 2014 film I absolutely loved: Ida. 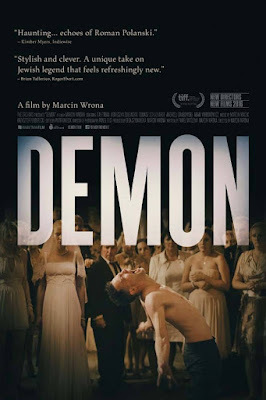 Because Demon is secretly also a film about Poland's troubled history with its Jewish population during World War II and beyond. In Ida, two characters went digging for a past that the small town Polish people had tried so hard to hide; in Demon, that past, sick of being hidden, reveals itself explosively to a small town that badly wants to pretend like it never happened. It is important that the creature be a dybbuk, an evil spirit in Jewish lore; it is equally important that it be unleashed by an unexplained skeleton buried surreptitiously on the family's grounds, something they gloss over every time it is brought up. Even its more oblique conclusion, which feels fairly unsatisfying in the moment, grows in depth the more one considers what it means within the film. Demon has it all. Gorgeous, eerie performances, a striking theme explored with depth and nuance, and excellent camerawork and editing that make the supernatural feel mundane and everyday in a way that can sneak up on you. In a year that has seen the release of some of the finest horror movies and psychological thrillers I've ever seen, Demon more than earns a spot as one of the year's best. Sadly, this is Wrona's final film, as he tragically committed suicide shortly after its premiere last year, but it stands as a powerful, chilling statement about the unspoken and unseen forces that can define and perhaps derail our lives. Demon is out now in limited release. It will be available on Amazon Instant in December of 2016. 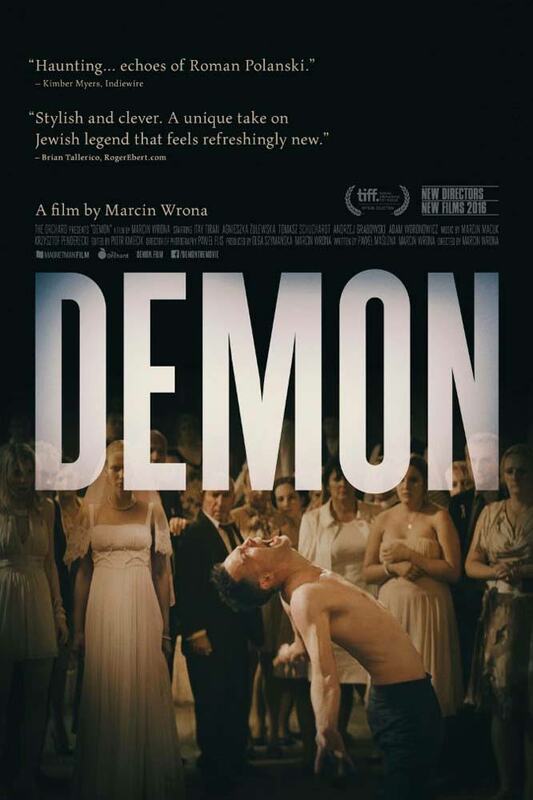 Written and directed by Marcin Wrona, Demon stars Itay Tiran and Agnieszka Zulewska.